Advocate for cats prevents parasite infections, fleas, heartworm, gastrointestinal worms, lungworm and ear mites. Advocate does all this with a simple and singular application of the treatment per month. Just a drop on the back of the neck and your kitty can continue his curiously cute dominion over all he or she surveys without you having to fear the potentially severe health effects of a parasitic infestation. 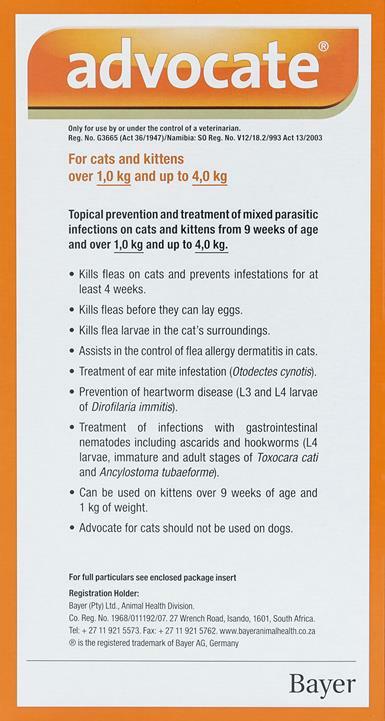 Worming treatments on cats, especially heartworm treatment is an extremely important year long practice. You never want your cat to have to deal with such an easily preventable problem. Can I use Advocate and Frontline Plus at the same time?